The Castle was originally built in 1891 for a local lumber baron, Nymphus B. Holway, as a three-story, gable-roofed frame house. The architects, Schick and Stolze of La Crosse, were intent on creating a home fit for a king, so the following year, the home was made more fashionable with the addition of stone facing. Holway House was born. Unfortunately for Mr. Holway, he died before the house could be completed, so his widow, Jessie Holway, lived there instead. The Holway family continued to be involved in the La Crosse lumber industry, running a large sawmill on the bank of the Black River. Mrs. Holway lived at the home until the 1920's when she sold the massive residence to the Diocese of La Crosse. The home then became the Bishop's House and was owned by the Catholic Church for the next several decades, known by residents of the area as The Castle on Cass. In the 1970's, the Carlisle family purchased the Castle and restored the interior of the home to its original appearance. After a few decades, the Wood family purchased the residence, returning the Castle to a single-family residence through major renovations. 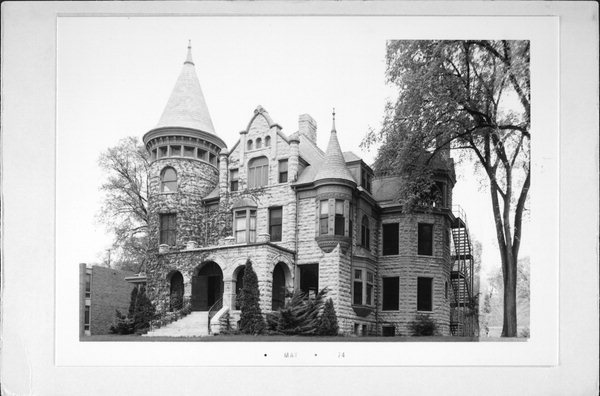 Today, the "Castle on Cass", currently known as Castle La Crosse, is important as a long standing architectural landmark, notably significant as the only mansion left in the City exhibiting massive Romanesque influence. Castle La Crosse is now a grand bed and breakfast featuring numerous bedrooms with private luxury baths, finely carved fireplaces, beautiful leaded and stained-glass windows, a library, and a music room. We are very proud of our home and welcome any questions you might have on the architecture and history. We would love for you to stay with us! Just shoot us an email to check our availability or click the button below to check out our lovely suites. Each suite has magic qualities all its own. Check Out Our Lovely Rooms! Our region is blessed with four distinct seasons and much of its charm derives from the variety of activities available in the area. In Winter, enjoy snow-skiing and sledding in the nearby hills. Hundreds of miles of trails are just a short ride away. Celebrate the Holiday Season with the Festival of Lights or just snuggle by one of our many fireplaces at the Castle over a mug of hot cocoa. Spring is the optimal time to take part in birding. Get your binoculars out as La Crosse, WI is located along the Mississippi Flyway, a migration route for more than 325 bird species that make the round-trip each year from their breeding grounds in Canada and the northern United States to their wintering grounds along the Gulf of Mexico and in Central America. If birding is not to your fancy, there are Spring Festivals galore around La Crosse and the surrounding region. Check out the St. Patrick's Day Parade in March, Mid-West Music Fest in April and Memorial Day Parade/Celebration in May. The La Crosse Visitors Bureau has a list of all upcoming events. Boating, fishing, hiking and golfing will keep you occupied during the summer months. Explore the Mississippi River by boat and imagine Huck Finn along the shore. Or just relax with a glass of wine among friends. Fall is a spectacular time of year in Wisconsin. The turning of the leaves brings the hills alive with a blaze of color. Enjoy clear crisp days and gentle autumn breezes. Take a drive along The Great River Road to view the scenery and historic towns. Stop at one of seven wineries located within 50 miles of La Crosse for a taste of wine varieties grown in the region. And don't forget Oktoberfest!